We are sometimes called a "weenie dog" because our long body resembles a hotdog (or frankfurter), and we are also known as Badger Hounds in some locations. We are derived from the oldest breeds of German hunting dogs and we have traced our ancestry as far back as the 16th century. All three varieties of us are pictured here. 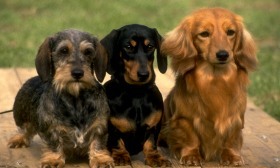 I am the smooth-haired variety and I was chosen to tell our story because the smooth- hair was the original Dachshund. My wire-haired cousin here with me was produced by a cross with the Dandie Dinmont, and my long-haired friend was the result of breeding the German Stober with a Smooth-haired Dachshund and Spaniel cross. All three of us come in both standard and miniature sizes. We are very good-natured and make excellent family pets. We have an especially loud and deep bark for our small size and we make pretty good watchdogs. Sometimes we need help maintaining a healthy weight since being overweight causes back problems for us. We also have trouble jumping and should not be encouraged to do so. When fully grown, I am between 5 and 9 (same for the miniature) inches tall (12.7 to 22.9 centimeters) and I weigh between 15 and 33 (under 10 for the miniature) pounds (6.8 to 1489.5 kilograms). We have no Dachshund Breeders listed at this time. Click here to place your Dachshund Ad!